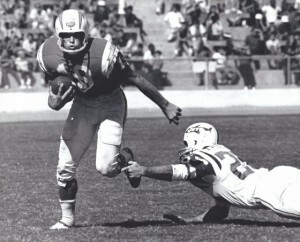 Lance Alworth heads down the field in a game against the New York Jets on October 13, 1963. 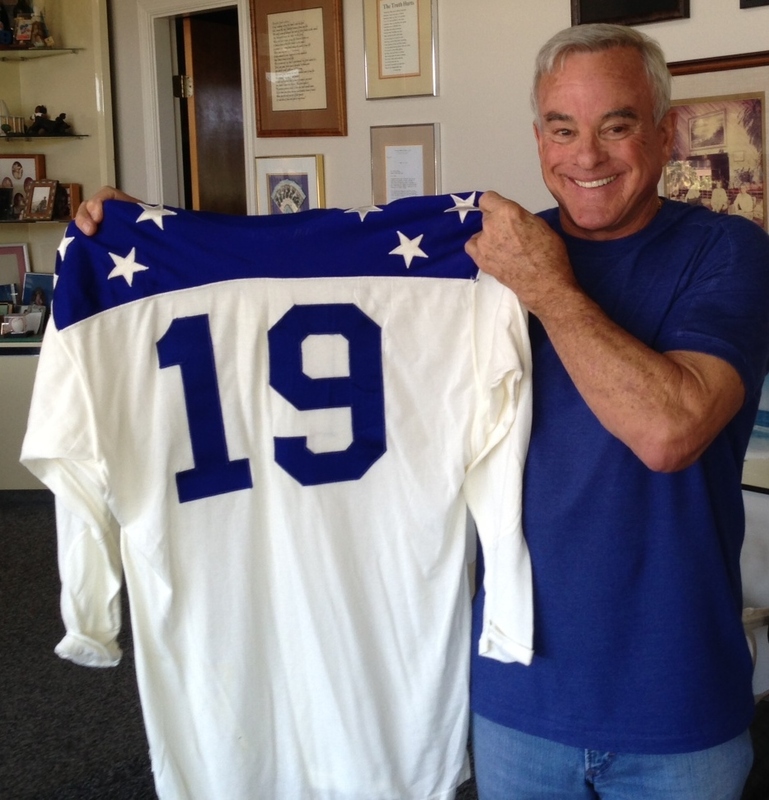 After spending a couple of days working in Lance Alworth’s football archive a few weeks back, I posted an article featuring Lance’s 1964 AFL All-Star Game jersey, which he still owns. 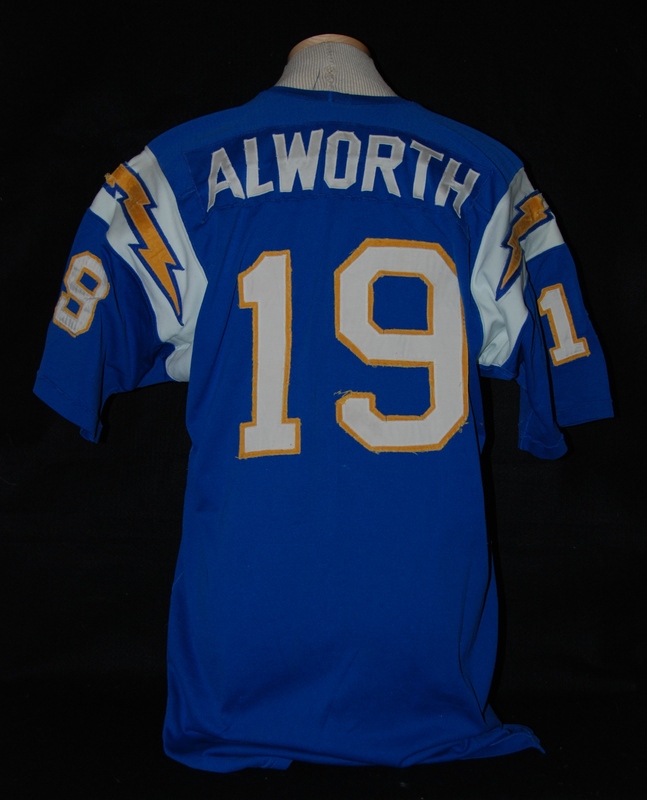 It is a beautiful jersey, and the photos that I took of the jersey gave many AFL fans their first look at a jersey from that game in full, living color. Houston Ridge, Jeff Staggs, Bob Howard and Gary Garrison in 1969. There are a lot of fun facts about the AFL that make you pause and think for a bit. You may be scratching your head over the futility of the situation, the odds of the occurrence, or simply the inherent “coolness”, but the list of truths below will give you pause and make you think a bit. 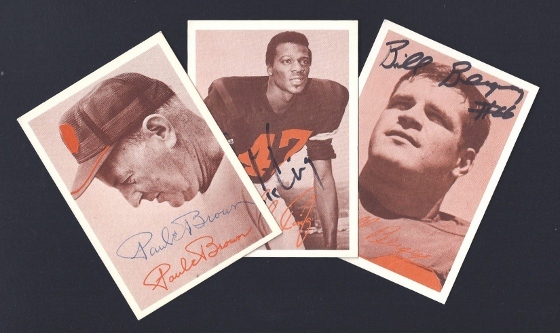 Running back Joe Auer scored on the very first and very last plays of the Miami Dolphins inaugural season of 1966. New York Titans owner, Harry Wismer, had to compete against the New York Giants for football fans in the Big Apple. When a reporter asked Wismer how he came up with the name for his team, Wismer is said to have responded, “What is bigger than a Giant? A Titan!” Along with his handlebar mustache and penchant for playing after the whistle, Ben Davidson is known for his deep and gravely voice, which ge got after receiving a punch in the throat from Kansas City Chief, Jim Tyrer. 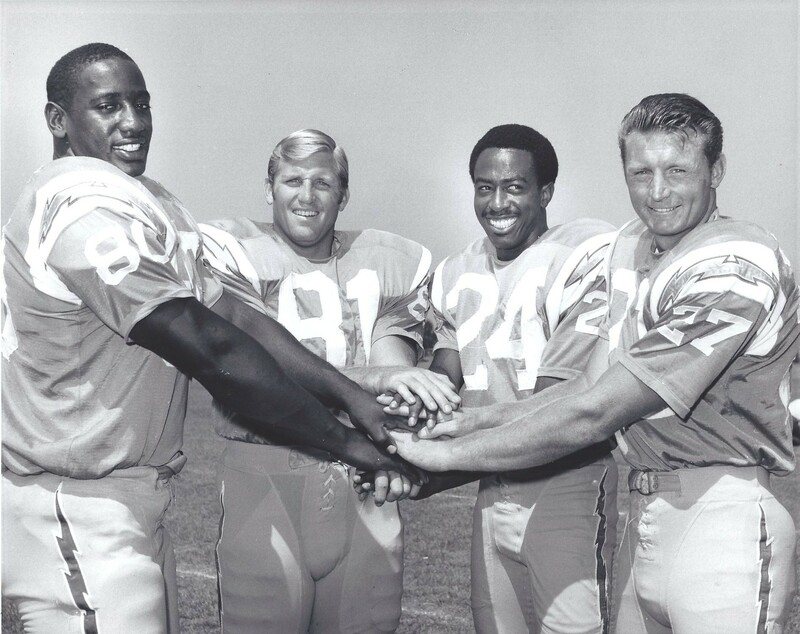 Though they played for the Chargers during their rookie seasons (and the better parts of their careers), Hall of Famers, Ron Mix and Lance Alworth, were not drafted by the Chargers. 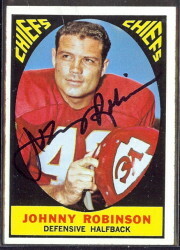 Mix was drafted by the Boston Patriots, and Alworth by the Oakland Raiders. The New York Titans first ticket office was owner Harry Wismer’s bedroom. Fans would go to Wismer’s apartment, and be led to the bedroom to purchase tickets, which he had spread over every flat surface in the room. Frank Youell Field, early home of the Oakland Raiders, was named after an Oakland-area undertaker. The Denver Broncos assistant general manager in 1966 was a man named Carroll Hardy. 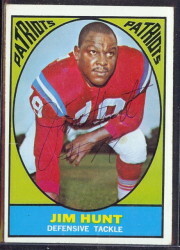 Hardy, who had played halfback for the San Francisco 49ers in 1955, also played major league baseball for the Boston Red Sox, where he pinch-hit for both Ted Williams (only man ever to do so) and Carl Yastrzemski. 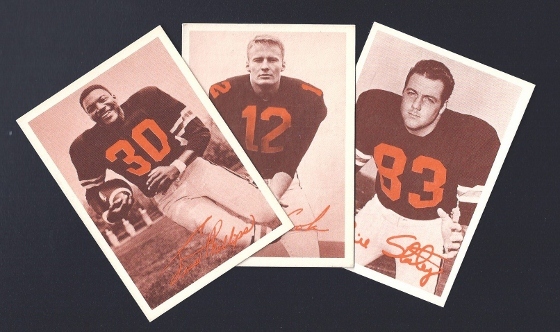 The Boston Patriots had men named Bob Dee, Bob Fee and Bob Lee, all trying to earn a spot on the team in 1960. From 1966-1968, the Miami Dolphins has a live dolphins named “Flipper,” in a tank in the east end of their stadium. Raiders Hall of Fame center, Jim Otto originally wore #50. 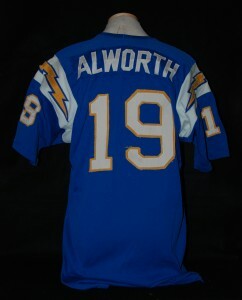 He changed his number to 00 as part of a publicity stunt to go along with his last name. Otto = Ought-Oh = 00. 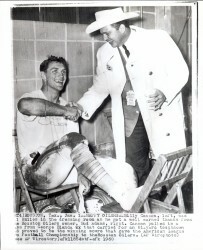 Hank Stram is the only head coach to maintain a head coaching position with one team during the entire span of the AFL. 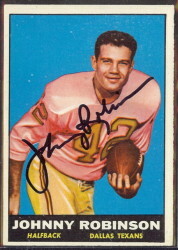 The Chargers Sid Gillman fell just short of the accomplishment, resigned due to health reasons just with four games left in the 1969 season.